My political education occurred during the years of minority government in Ottawa, when the Bloc Québécois was assured of winning a majority of seats in Quebec and elections were decided in the rest of the country. Quebec was a No-Man's-Land where only some 20-30 seats were ever at stake, making the province about as electorally important as the Prairies, Alberta, or Atlantic Canada. And, since a good portion of those seats went unchallenged just as in those other regions, the significance of Quebec in the electoral math was tiny. The election in 2011 and the downfall of the Bloc Québécois changed all that. With the New Democrats now a major player in the province and the stigma of the sponsorship scandal apparently exorcised by the arrival of Justin Trudeau for the Liberals, Quebec is a major battleground and will play an extremely important role in deciding who wins the election in 2015. 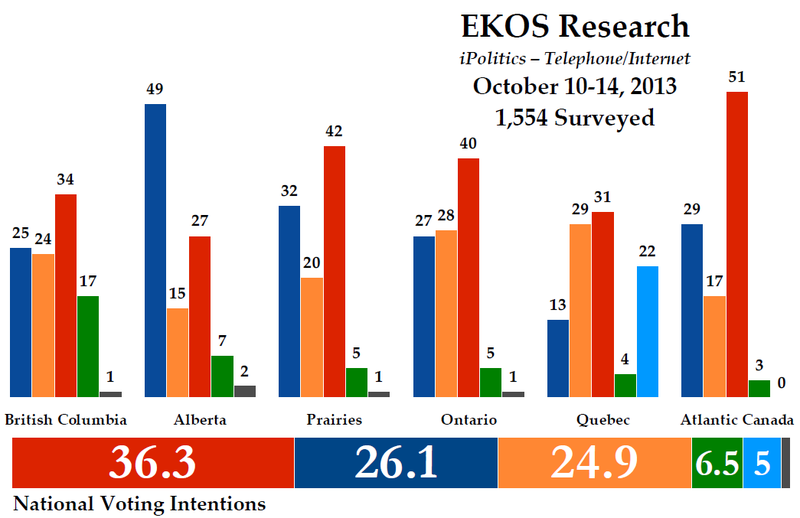 A new iPolitics/EKOS Research poll released this week illustrates the importance of Quebec to the Liberals' electoral calculations. "The methodology is interesting. It is based on an RDD recruited panel which includes both cell phone and landline households. Unlike other panels, live interviewers have interviewed all respondents to verify who they are and get a dossier of basic information. We cover those who cannot or do not want to do the interview online using a hybrid. In this case, we did live interviews with that portion of the population...In short we end up with a probability panel which covers virtually the entire population." We are seeing this sort of hybrid approach more and more. It certainly muddies the methodological waters, but it seems like a good compromise instead of going whole hog into the online field or sticking with the old methods. But back to the subject at hand. This poll is about as good as the Liberals can hope to achieve in 2015 - everywhere except in Quebec. Their strength in British Columbia in this poll is about as high as it has been in any poll since Trudeau's leadership victory, and the nine-point lead over the Tories is significant. Being in the high-20s against a weakened Conservative Party in Alberta opens up a few seats, while a lead in the Prairies is something rarely seen. Having 40% in Ontario is a plausible high for the Liberals, but a 12 or 13 point lead over the Conservatives and NDP is huge. And having majority support in Atlantic Canada is also big for the Liberals. That these numbers are among the best the Liberals have managed in years probably points to the poll being on the outside edge of the margin of error. We will see what other surveys say in the coming weeks. 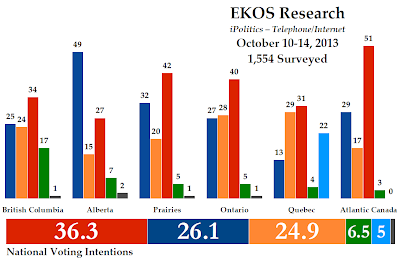 But as an example of a best-case scenario for the Liberals in 2015, this EKOS poll will do nicely. Again, except in Quebec. Aside from Alberta, Quebec was the worst region for the Liberals in this poll. With only a two-point lead over the New Democrats, the party is not in a position to win a lot of seats in the province. And with the Bloc Québécois down only a few points from their performance in 2011, it makes it possible for them to come up the middle between the Liberals and NDP and hold on to a few seats. This is not a good recipe for hopes of a Liberal majority in 2015. The seat projection bears this out. The party does extraordinarily well in every other part of the country, winning the plurality of seats in British Columbia and the majority in Ontario and Atlantic Canada. A few seats in Alberta and the Prairies adds to the Liberal haul. With the exception of Quebec, this is a blueprint for how the Liberals could plausibly win a majority government in 2015. But because of the close race in Quebec with the NDP, which has greater strength among francophone voters (at least according to the latest Le Devoir/Léger poll), the Liberals only take 24 seats in Quebec against 41 for the New Democrats. The Conservatives manage to pick up a few extra seats due to the sagging NDP vote, while the Bloc is able to hold on to theirs (or at least the equivalent number). Primarily due to Quebec, the Liberals find themselves 28 seats short of a majority in the 338-seat legislature. That Léger poll was slightly better for the Liberals than EKOS's result, giving them 33% support to 26% for the NDP and 22% for the Bloc. Using that poll's regional results, the model gives the Liberals 29 seats to 33 for the NDP, nine for the Bloc, and seven for the Conservatives. Bolted on to the EKOS numbers, that improves the Liberals' national total to 146 seats, or 23 seats short of a majority. It is hard to imagine the Liberals doing better than EKOS's results outside of Quebec. Certainly, a few good candidates and efficient swings could turn a handful of extra seats in British Columbia, Atlantic Canada, and Ontario over to the Liberals, but the party clearly needs to be able to win a majority of the seats in Quebec if they are to have a hope of winning a majority of seats in Canada. They simply are not going to be able to squeeze more seats out of the rest of Canada without a major shift in voting patterns. It is theoretically possible for the Liberals to win Quebec. The best numbers the Liberals have put up in Quebec since the last election was a Forum Research poll conducted just after Trudeau became leader in April. It gave the party 46% support in Quebec to just 22% for the NDP and 18% for the Bloc Québécois. In other words, it assumes a swing of the same magnitude as the one that propelled the New Democrats to first place in Quebec in 2011. With numbers like that, the Liberals would be able to take some 56 seats in the province, leaving 12 to the NDP, seven to the Conservatives, and three to the Bloc. That gives the Liberals their majority. However, the Liberals are far removed from those heady days. The party is slumping in Quebec compared to the Trudeau honeymoon stage to the low-30s which, due to the concentration of the Liberal vote in and around Montreal (Léger gave them 40% there in their recent poll, compared to around 28% in the rest of the province), is not nearly enough for them to win half of the seats in the province. What do they need to be in range of that? Using that Forum high-watermark poll as a base, and swinging the vote only between the Liberals and the NDP, we see that the Liberals would need around 41% or 42% of the vote in Quebec and a lead of 14 to 16 points to be able to win a majority of seats in the province. That means they need to win about as big as the New Democrats did in 2011. That is a high hurdle to jump. But now that Quebecers will play a major role in deciding who wins the next election the dynamics of the federal race in the province in 2015 will be unrecognizable compared to what it has been since the Bloc Québécois burst onto the scene in the early 1990s. The election will not be about jurisdictional disputes or the sovereignty issue and it won't be about rejecting one party (the PCs in 1993, the Liberals in 2006, the Bloc in 2011). Instead, it will actually be about who might form the next government or, in the case of a Conservative rebound, what the opposition looks like in an almost certainly minority parliament. How will Quebecers react to this re-discovered influence? It's also rather amazing to me how despite a 10-point lead over the CPC in the Prairies, the Libs only win half as many seats. Astounding to not even come close to winning that region despite getting *42%* of the vote. I'm guessing some very severe NDP/Lib vote splitting is to blame? It is primarily because the Liberals did so horribly in the Prairies in 2011. They had 13%, so increasing that by a little over three times only helps them move into contention in seats where they had more than 10% of the vote in 2011. There were only eight of those in the 28 ridings (and only one in Saskatchewan!). I'm interested in knowing how you project the northern seats, when they are never discussed in your analyses. The polls rarely if ever discuss the north, I'm assuming due to the difficulty in getting any reliable numbers. For the northern seats I just use the national voting intentions for the swing. I prefer the dart board and a bottle of bourbon method. 33.0% Conservatives (140 seats), 32.4% Liberals (92 seats), 24.3% NDP (72 seats), 5.2% Green (1 seat), 5.1% Bloc (1 seat). I know that in the UK they take how people claim to have voted in 2011 into account in their weighting, but that people also tend to "misremember" who they voted for when they plan to vote from someone different in the next election. I was wondering if you could comment on the discrepancy. Do you feel Liberals were oversampled in this poll, or are 2011 Tory voters just embarrassed to admit who they voted for in 2011? By the way, I have to shake my head at having an article titled "Why the Liberals need Quebec in 2015" that includes a seat projection showing Trudeau forming government without the need for a strong showing in Quebec. Quebec is pretty important to determining whether the Liberals or the NDP come out on top out of the current opposition parties. That will be pretty irrelevant if the Conservatives sweep the board in Ontario and BC. Quebec definitely matters, but I think you're exaggerating how much it will matter. To me the bigger question is whether or not the Liberal+Green+NDP seat totals will exceed the Conservatives' total, allowing them to form government without the support of the Bloc. Yes, that is a good point, but I would assume every party wants to win a majority. I'm not sure if the NDP will want to support the Liberals in a minority legislature, even if the CPC ends up with the plurality. Also, this poll is a pretty much best-case scenario for the Liberals in the RoC. I don't think that is a very reasonable thing to expect, so the Liberals will need to do better in Quebec (a lot of the projections I have done that have the LPC losing the seat total but winning the popular vote is in part due to Quebec). As to the crosstabs, I'm not exactly sure what you mean. I got that the sample was 35% CPC, 29% NDP, and 25% LPC in terms of 2011 vote. Are you referring to the results if you weigh the poll by 2011 voting? I'm not sure why there is always this discrepancy, I assume it might be because people misremember but also because they may be mixing provincial and federal votes in their minds. Every party (except the Bloc) wants to win a majority, but that doesn't mean they're realistically going to get it. It's true that NDP support for the Liberals isn't guaranteed (nor Liberal support for the NDP). I think it's safe to say on confidence motions it would be highly likely though. Whichever of the two parties blinks and props up the Conservatives at this point will alienate both their base and that huge pool of soft centre-left voters that they are both competing for. Neither Mulcair nor Trudeau is that stupid IMHO. Yah, I'm referring to the results if you weigh the poll by 2011 voting. The way you present it paints the same picture though - too many Liberals and too few of everyone else. Your point re: provincial politics is a good one though. Hmm. Yeah, I think the battle for Quebec will be the one that determines whether or not the NDP or Liberals will form the top side of the coalition. True, it's possible (like in this poll) that the Liberals still could outdo the NDP despite sluggish yields in Québec, but like you said this is their best case outside of Québec (well, it's decent Alberta results, but that's about it).. Trudeau basically has to tie Mulcair in Québec in order to be PM in the event of a minority and/or coalition. He has to win big here in the event of a majority. OTOH, Mulcair's shot towards a minority / top half of a coalition, would be first to solidify his Québec base and gain clear control in the province (high single digit lead or so), and then work a base into more seats in Ontario (perhaps mimicing a somewhat the Horwathian strategy for SW/North/key targets like Kitchner, etc.). A minority/majority from then on be determined by his success in significant BC/Atlantic/Prairie/Rae-like success around (or variations between). But actually by seat efficiency, Mulcair could very well get 30-31% of the vote and end up as #1 or 2 in seat counts (after Conservatives), and the Liberals could very well end up first in vote count and 3rd in seat count thanks to strong efficiencies in Quebec/Alberta for the NDP/Tories. There will not be a coalition between the NDP and Grits post-election 2015. In Westminster systems coalitions only occur in times of national emergency or crisis. Trudreau for all his faults is no idiot. He knows that if he wins a minority government his majority will rest in his ability to wrest NDP seats into the Liberal fold. To attack the NDP in such a scenario would be to attack his own record in government. The same can be said from the NDP point of view. A coalition is not in the best interests of either party especially when there would already exist a de facto coalition of likeminded MPs. Do you count the current situation in the UK as a national emergency, or a crisis? No, I'm not betting on a coalition in the near future in Canada (although I wouldn't rule it out.) But is isn't such a foreign idea in the Westminster model. I could also bring up the example of Ontario in 1985 -- technically not a coalition, because cabinet seats were not shared, but still something very close, because a complete 2-year agenda was negotiated between the two parties. I think most of the time when I hear people here advocate for a coalition, they have a broad enough understanding that they would be satisfied by a Peterson-Rae style arrangement. As you may recall in May 2010 the UK was in a very serious economic crisis. Pressure was being exerted on Sterling and gilts which was problematic as the Treasury and Bank of England wanted to introduced quantitative easing. Obviously government stability was a prerequisite to guarantee low interest rates for QE. Well you have brought up the Ontario example and correctly note it was not a coalition! In hindsight the ability of the Rae-Peterson Accord may appear to be close to a coalition but, after the accord was signed there were no consultative structures set up nor any way the NDP could influence ministerial implementation or decisions except informally. The NDP remained an opposition party. However, because the accord itself guaranteed legislative action it is likely NDP MPPs participated in the drafting. In many ways Rae-Peterson is akin to Martin-Layton budget or Harper and the Dion-Ignatieff abstaining Liberals as opposed to a coalition. If the NDP withdrew support for the Liberals Peterson would not have been obligated to resign. |Fundamentally, coalitions are about sharing responsibility. Cabinet solidarity is enforced in Westminster systems and at one time the convention of cabinet responsibility was. Frankly, I have always viewed polling results from Ekos with a great deal of skepticism... or quite frankly... with humour. Ekos always provides completely wonky results with their robo-polling. "It is not really possible to compare this poll to the last one from EKOS from early July, as that poll had been conducted via IVR whereas this one was conducted with a hybrid telephone-online methodology." Well... in BC, Justason Research also utilized the exact same "hybrid" approach and gave the BC NDP a "22 point" lead just 2 weeks before the recent BC election. We all know how that turned out. Again, Ekos has just never provided credible numbers over the past few federal elections IMHO. EKOS does seem to have a pattern of underestimating Conservative support and overestimating Green support. Their final poll of the 2011 campaign had the Cons at just 34%, whereas all the other familiar pollsters had them at 36-38%.